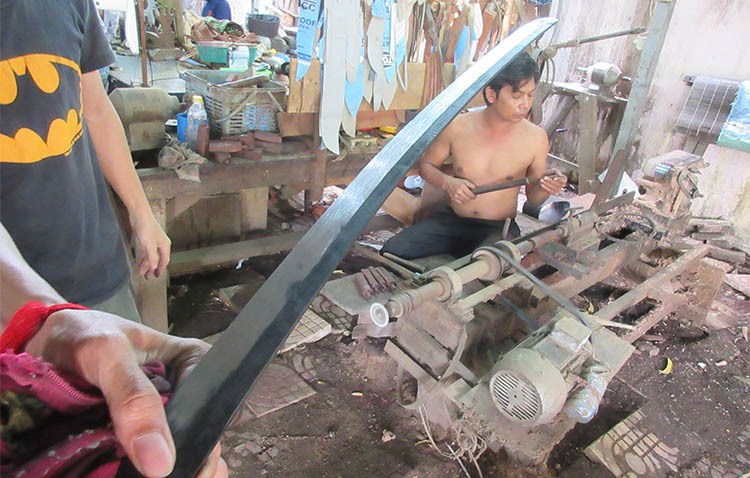 When I first heard that Citadel Knives and Swords were forged in Cambodia, and had a reputation for producing Katana of such a high quality that even the Japanese acknowledged their work, my ignorance about this little known country conjured up images of a strange and mysterious forge operating deep in the steamy jungles of South East Asia.. While it is true that Cambodia is a developing country, set back decades by the genocidal Khmer Rouge in the mid to late 1970s and made famous by Angelina Jolie's 'First they killed my father' movie - Citadel Knives and Swords is not based in a remote jungle somewhere, but is literally 2 mins down the street from the International airport of Phnom Penh, a vibrant and bustling city with a French Colonial influence dating back to Napoleonic times. 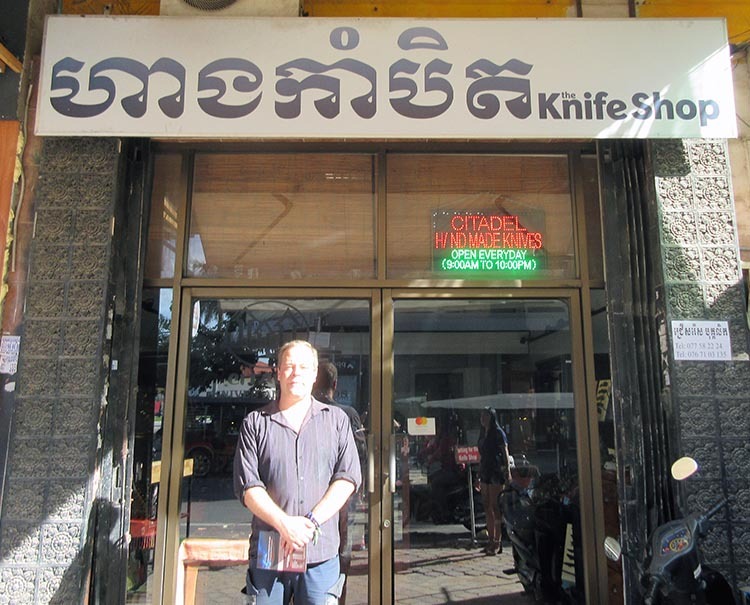 Most tourists to Phnom Penh would not even have a clue that here is one of the worlds premier makers of Japanese swords for discerning collectors and martial artists who demand the best. But they may inadvertently stumble upon their humble retail shop near the popular 'riverside' area and, talking to the friendly local staff there, get an inkling as to what they have come across..
Before my official visit to their workshop - I stopped by the Knife Shop - just around the corner from the riverside promenade on street 110 - just to see what was on offer..
Now naturally, Citadel Knives and Swords makes - well - knives and swords. 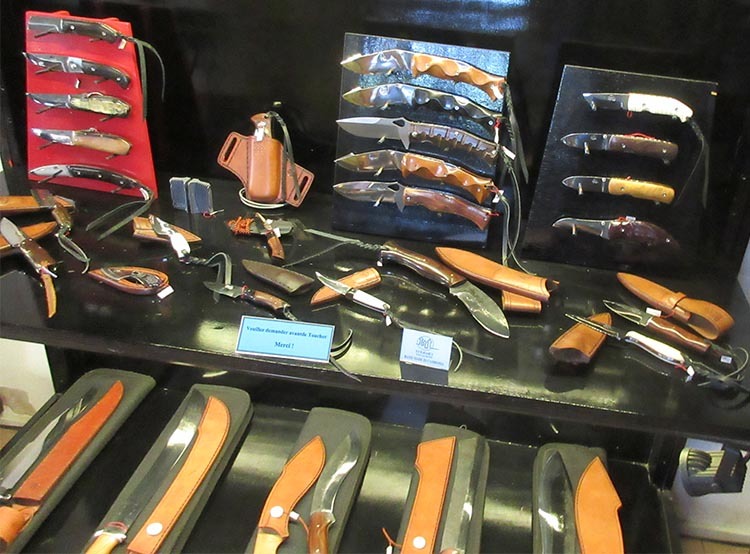 And though my interest was of course in the swords they had on offer there, I also checked out some of their beautiful knives, of which they had a stunning range and variety. 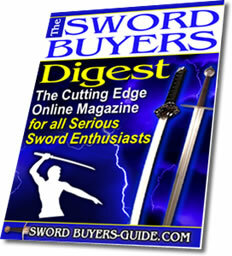 Of course, as this is sword buyers guide and not knife buyers guide - my attention was drawn to the handful of swords displayed there. Including some that were real surprises.. I certainly did not expect to find a small selection of European styled swords there - having no idea that Citadel Knives and Swords also made swords other than Katana.. 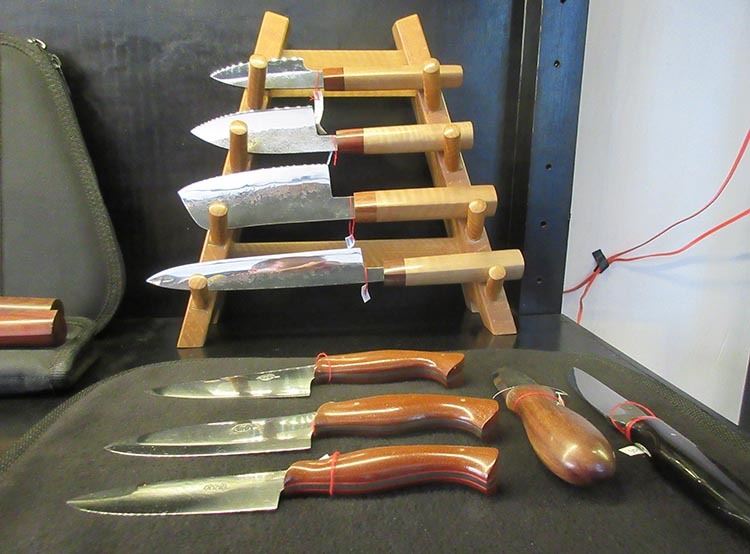 But as I later learned, they are a custom blade maker, and so over the years have and continue to make whatever their customer requires..
As long as it is functional that is - for they have no time or interest in decorative wall hangers. Which is of course, a philosophy I can embrace wholeheartedly! First taste of their attention to detail.. 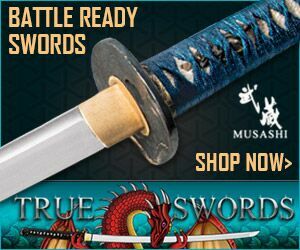 While the European styled swords were an interesting distraction, Citadel Knives and Swords is - as we know - most famous for the quality and authenticity of their Samurai swords. 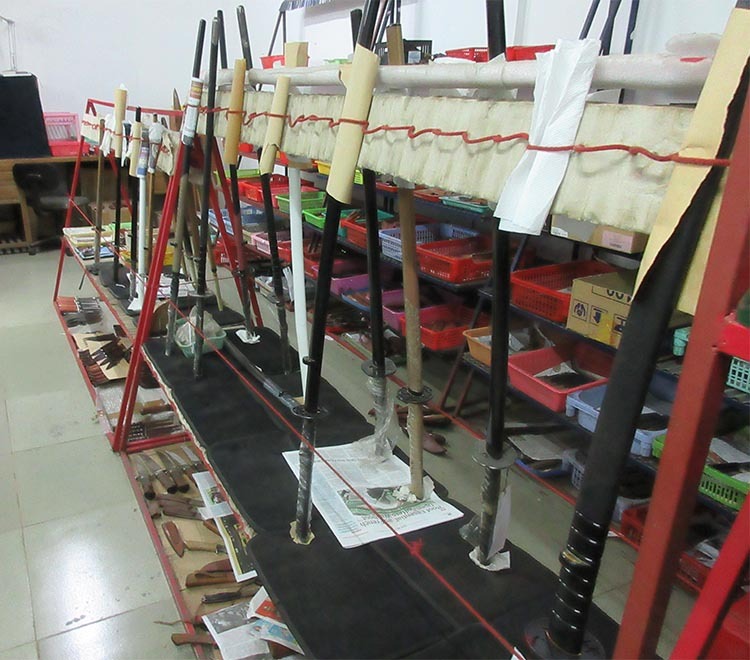 They did not have all that many at the shop - probably because as you can see from the photos, it is not a very big shop - and not many tourists would impulse buy a $3000 Katana as they might splurge $150 or so on a knife. But the one sword that they did have on display there - a humble Wakizshi - was one of the finest examples of a Japanese sword I have seen. 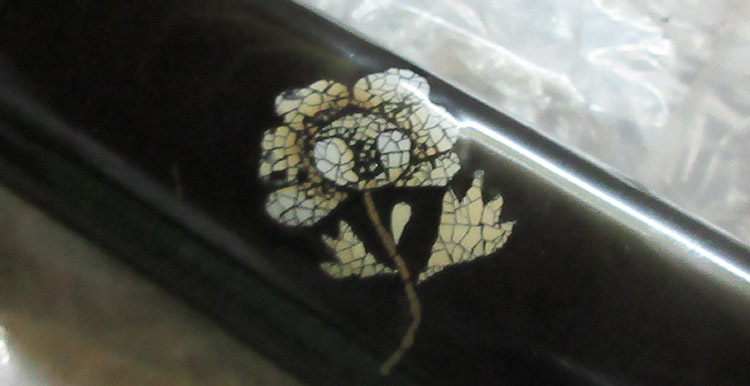 And if I had not been told, I would have thought it was a Japanese made Nihonto..
Just to give you an inkling of what I saw that day, here is a photograph of just the handle..
A couple of things to note here - one, this is a FULL rayskin wrap - not panels. 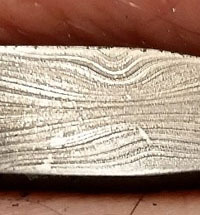 And this is no scrappy off cut, this is the best quality there is - with prominent 'emperor nodes' (large nodules) running down the center of the handle. Note also, one mekugi peg. 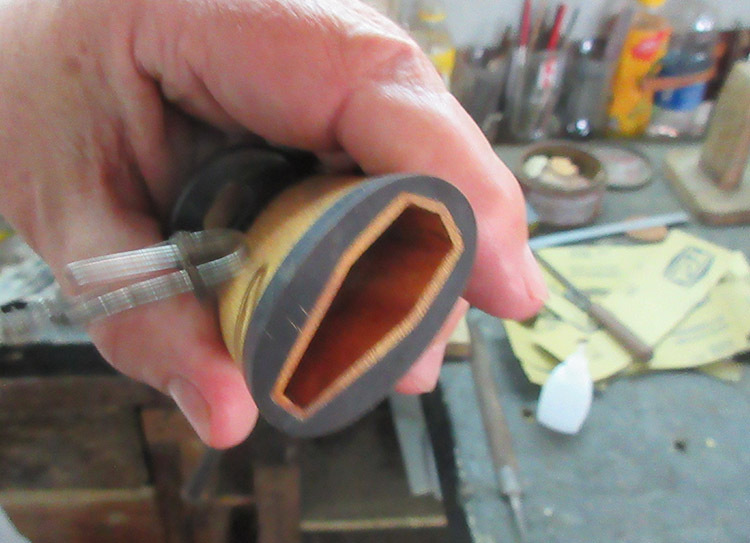 Not two - just one, because that is all a well fitted Katana had historically, and as I later learned, each tsuka core is carved specifically for the blade it will be mounted on. No one size fits all 'jam it on 'til it fits' approach here.. Note also the evenness of the ito wrap (which is imported Japanese silk ito by the way) - it is as tight as could possibly be and was wrapped using hishigami. 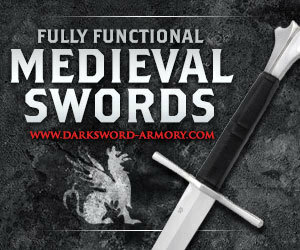 Just the handle alone makes this sword superior to 95% of all other Japanese swords on the market. 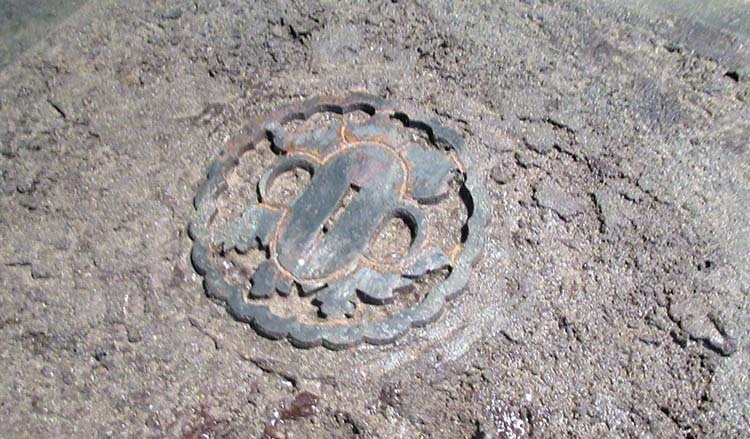 And we haven't even got up to the tsuba yet, never mind the blade.. 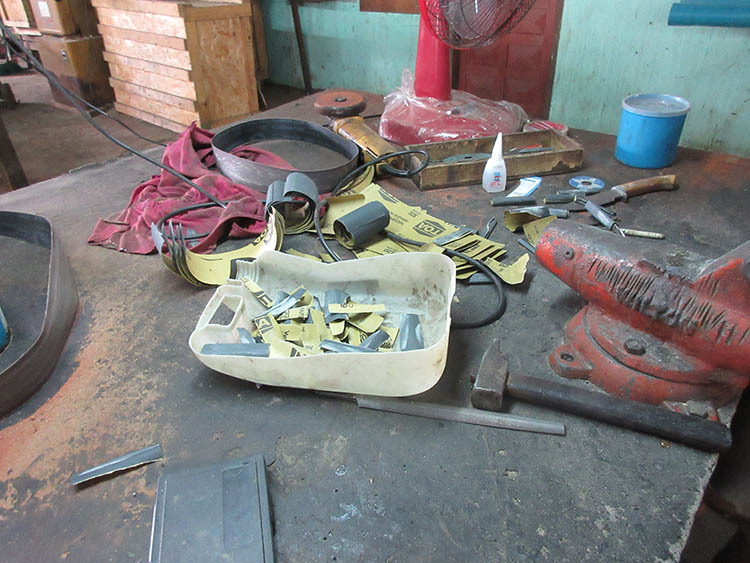 But to fully understand both the blades and the fittings, we need to go behind the scenes. 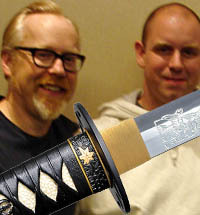 Perhaps the best word to describe how Citadel Knives and Swords came about is serendipity. 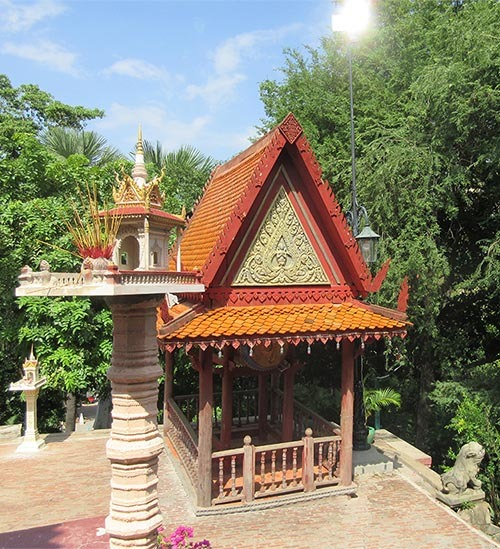 "Citadel’s founding and Cambodia’s unique position as a producer of some of most elaborate swords in the world all began in the early 1990s, when French businessman Dominique Eluere, 55, and some friends decided to open a restaurant in Ho Chi Minh City. 'We asked blacksmiths to reproduce French table knives. 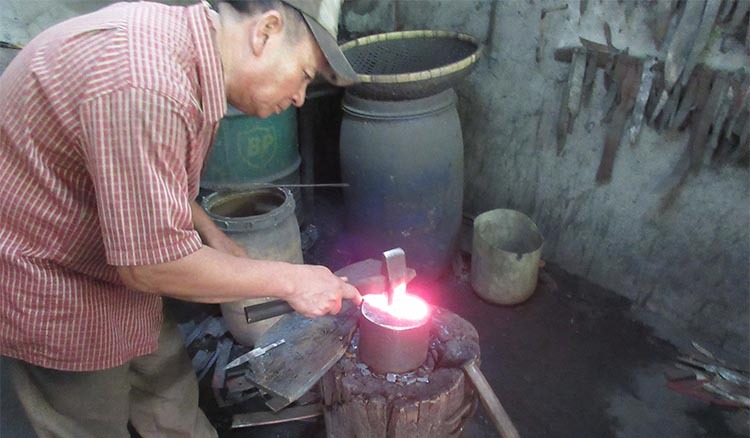 Later, when I arrived in Cambodia in 1997, we continued with Cambodian blacksmiths and we thought it would be funny to venture into Japanese swords because, actually, we are doing something impossible,' Eluere said." 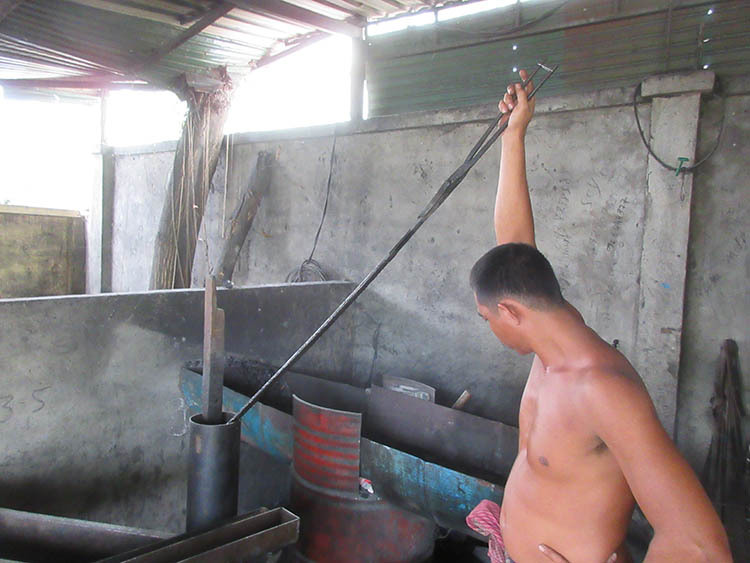 Bringing in the expertise of French trained weapon-smith Stephane Champagnac, Dominique set about training up a core of bladesmiths from disadvantaged local Cambodians - and as I walked around the forge and workshop with him, it was clear that his workers not only deeply respected him. 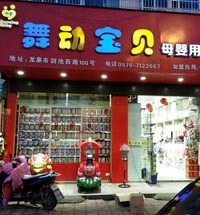 but saw him as a kind of father figure - and were proud of their job, their skills and the company. This is not only good for morale, but ensures the best products possible - and numerous times as I checked out the facility - he would be approached by one of the workers for his feedback on a particular sword or blade - and it was clear to me that communication here was very open, honest and clear. 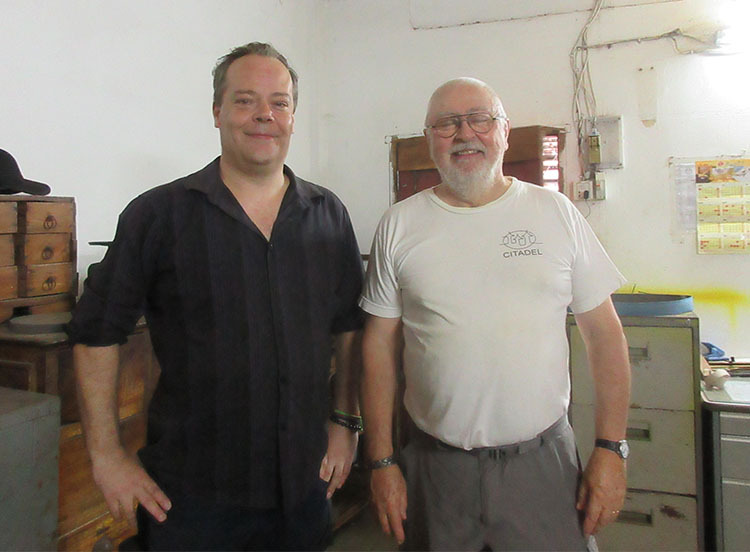 After a brief introductory discussion with Dominique, we took a stroll out to the forge itself - which was separated from the main workshop and had three main working areas. Dominique pointed out an anvil from the 1880s that he imported from France that I noticed was looking a little sad and lonely..
With typical good humor, Dominique explained that the workers actually preferred to use a smaller circular anvil as they felt they had more control when using it - especially when making the smaller knives..
We then moved on to the area that I was most interested in, and I was fortunate enough to witness one of their Katana at one of the most critical stages of its production - the moment when it is differentially hardened..
As you can see, using the spatulas to the left, the blade is carefully coated with a special clay mixture that leaves the edge exposed and sets the template for this particular swords hamon temper line - which in this case was a 'sanbon sugi' style. 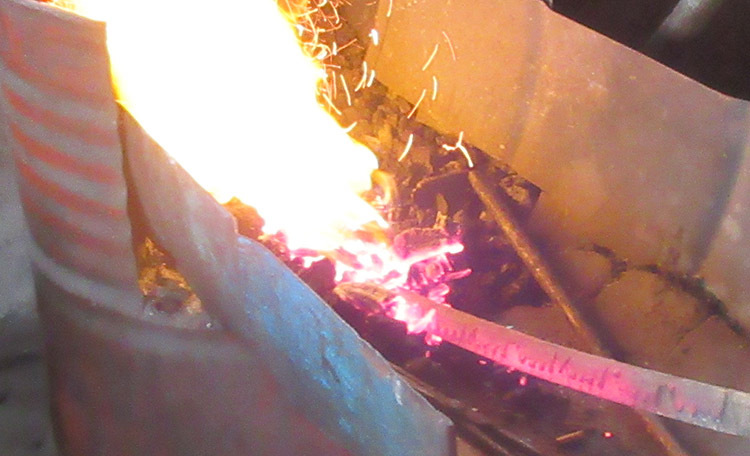 The blade is then heated up for around 5 mins in a bed of charcoal fanned by a hand cranked forge blower until it is red hot..
And at the precise moment when the entire blade is the right temperature, known to the smith by years of trial and error by subtle visual cues alone, the blade is picked up with tongs and inserted suddenly into a water filled tube - hissing and steaming as the magic happens.. 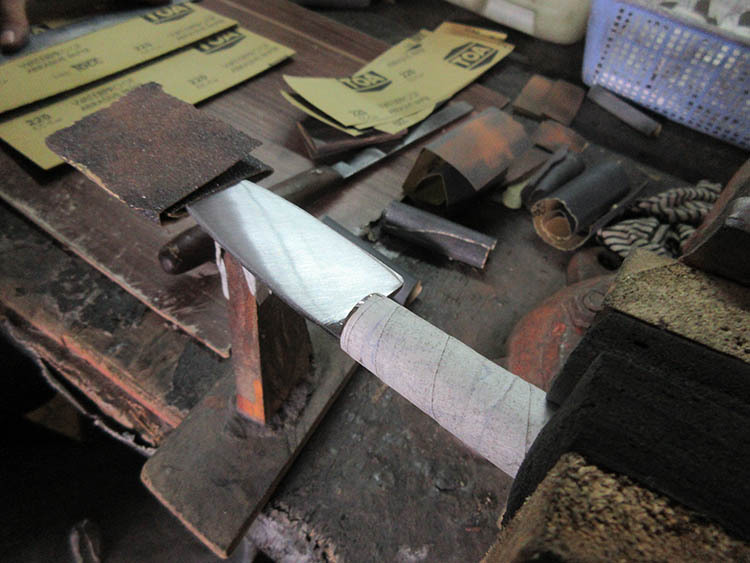 The clay causes the edge to cool much faster than the insulated spine, which turns to steel into hard martensite and the rest of the blade, pearlite - creating both the hamon and further curvature of the blade that are the distinctive characteristics of a genuine Katana. 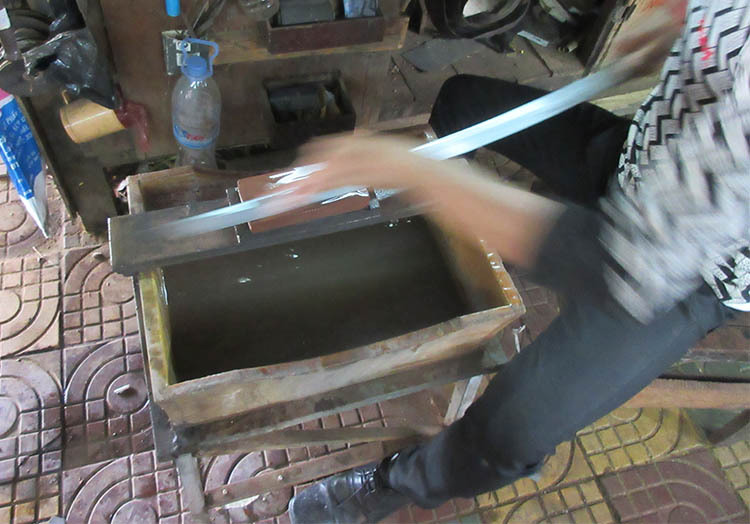 The clay is then scraped off on the ground and the hamon and blade inspected from every angle to ensure it can proceed to the next stage. Not every sword survives the process, which is another reason why differentially hardened Katana tend to cost more than those that are monotempered - as defective swords need to start all over again..
Ready for the next stage.. 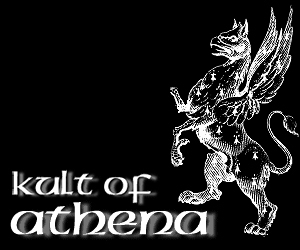 But that's just the start - once approved, its time for the refinement process to begin. And here is where Citadel Knives and Swords really stands apart from your run of the mill sword forge.. 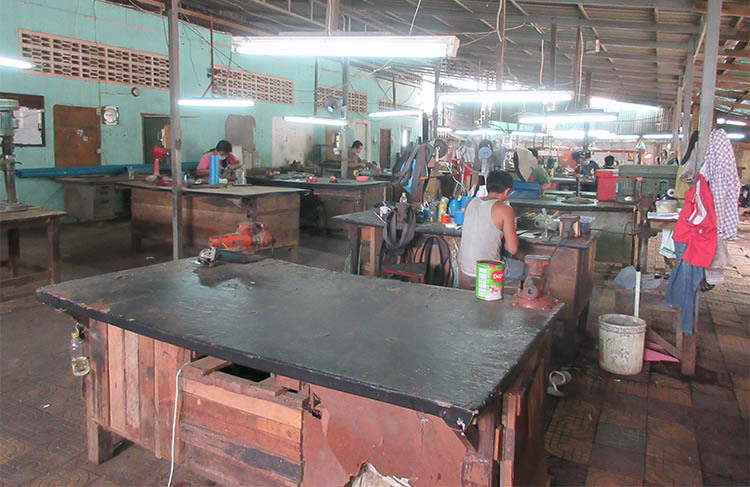 It's not a particularly big workshop - but Citadel Knives and Swords have never been about mass production - and never want to be..
What really struck me was the lack of machinery here. 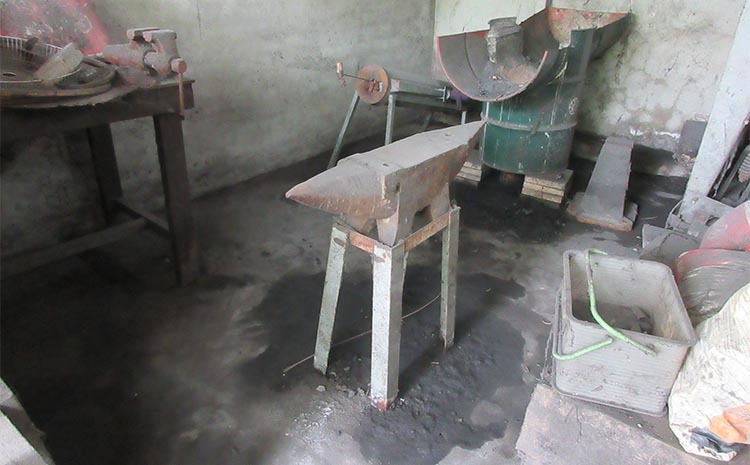 Yes, they had some angle grinders - and a couple were in use for rough shaping. 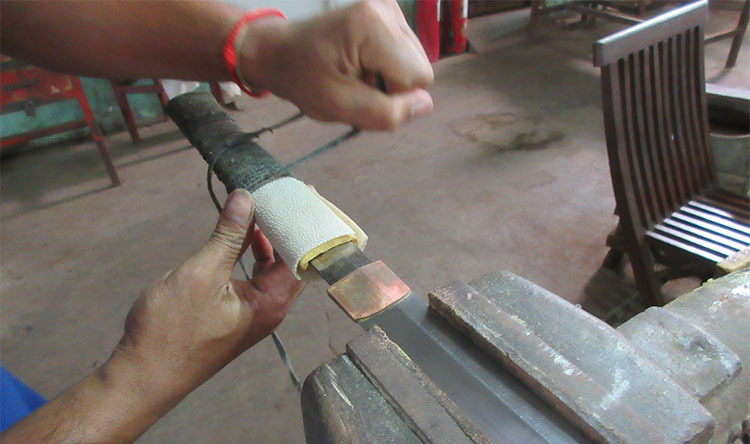 But only to check for any cracks or issues of the blade before further refinement can take place.. They even have a power hammer, but no-one actually uses it.. The secret, Dominique told me, is "sandpaper, sandpaper, sandpaper, sandpaper, sandpaper and - sandpaper.."
Dominique was only half joking - for one of the secrets to the amazing, even polish of all Citadel Knives and Swords is simply the amount of time spent refining, polishing and sanding the blades and fittings. This was something I noticed in the shop - the finish of every blade I saw was impeccable - and it was clear that no blade was permitted to leave the shop unless it was as close to perfect as humanly possible. Of course, other traditional polishing methods were used, such as whetstones and waterstones. 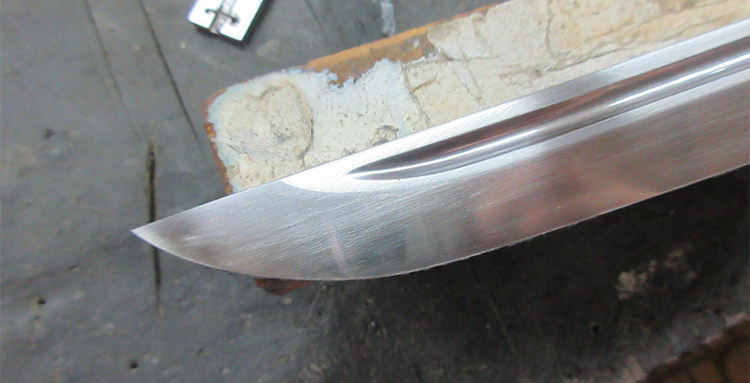 But it was often sandpaper, and lots of it, combined with good old fashioned elbow grease that took the blades at Citadel Knives and Swords to a whole new level of polish..
Take a look at the blade below and you will see what I mean. This level of polish is where most sword manufacturers say its 'ready'. 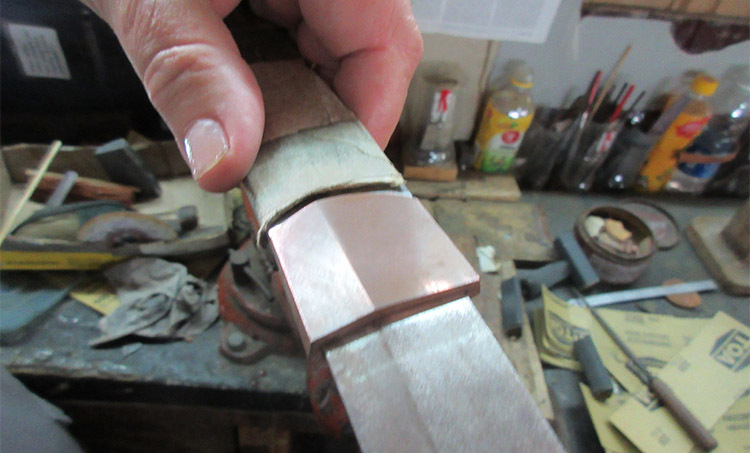 But not at Citadel Knives and Swords.. At this stage of the process, the blade is ready for the real polishing work to begin..
Another thing the perceptive among you may have already noticed is the termination of the bo-hi (fuller). 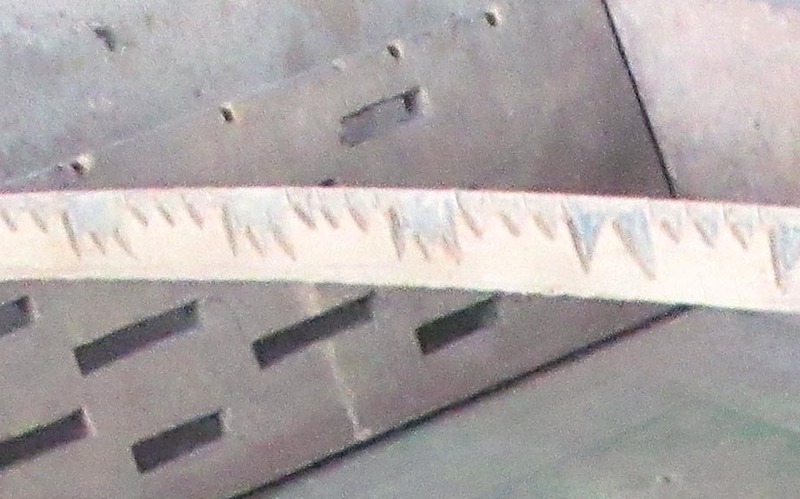 Most sword makers use a machine to carve it out, which leaves a distinctive rounded termination point. But here they are all hand carved, and the termination of the bo-hi follows the curve and shape of the blade in the traditional way. 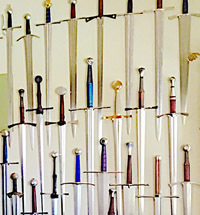 To Dominique, every single sword made at Citadel is a custom sword. Each one is a work of art. No two are exactly alike, but each blade - no matter if it is a one off or part of a limited edition run - is made the same way..
With a whole heap of hard work, attention to detail, and of course - lots and lots of sandpaper..
A short video of a sword being differentially hardened and polished up. 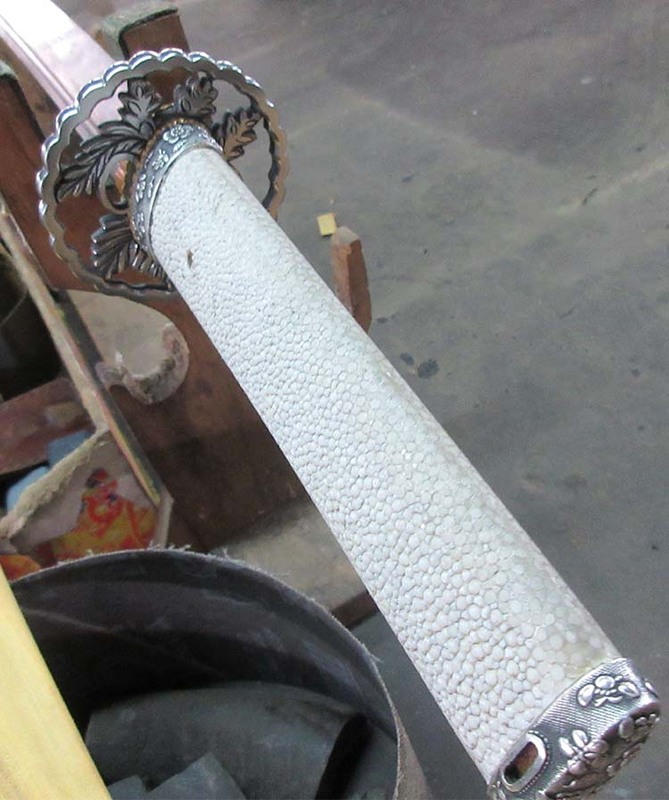 Another thing that separates Citadel Knives and Swords from other sword making companies is that each sword has fittings made for that particular blade..
Notice the sandpaper in the background of all pics.. Dominique was not kidding..
Notice how the buffalo horn is perfectly seated in the opening of the sheathe (the koiguchi). This saya was made to fit one specific sword - so that it is not too tight, nor too loose - and does not rattle when you shake it. It is perfectly made for the sword it will house. 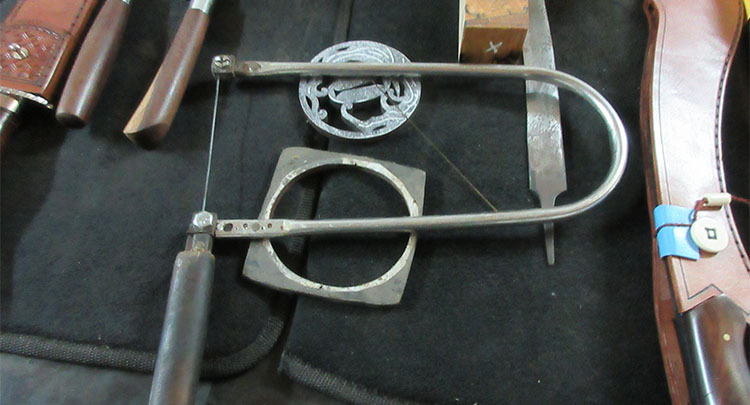 Now take a look at this habaki - the blade collar - considered by experts to be the 'heart' of a Katana. At Citadel Knives and Swords, the habaki is made and fitted while mounted on the sword it will be used with - not purchased in bulk and jammed on like most Chinese forges do.. 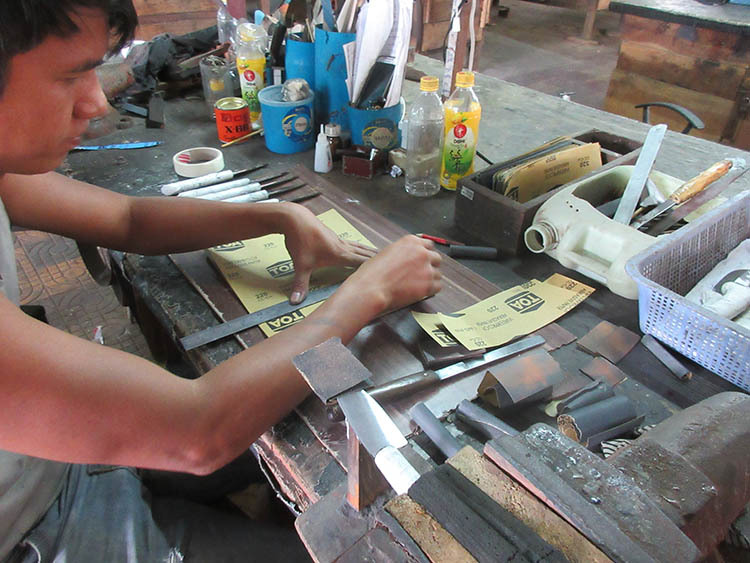 This not only ensures a perfect custom fit for the blade in the saya, but it reinforces the whole assembly. Very few companies actually make their own habaki these days simply to keep costs down. But that is not how Citadel Knives and Swords do it. 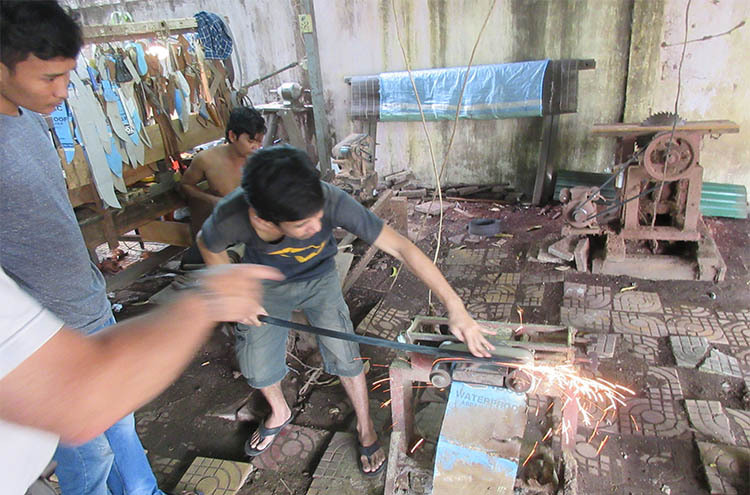 They keep costs down by manufacturing in Cambodia - and just doing what needs to be done. Anywhere else in the world, and the cost of production of swords like this would make them far to expensive..
And while they are still expensive, for what you get, its actually a bargain..
Another thing that they do differently, and what most collectors of Japanese swords long for, is a full rayskin wrap - not panels. And premium rayskin at that, not off-cuts or scraps. Usually everything is made in house - unless they feel they can get a better result from elsewhere. 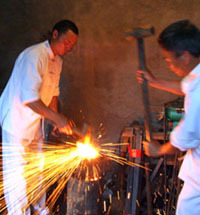 For example, most of the fittings they make themselves - taking a thick sheet of iron and cutting it to shape with a hand saw.. 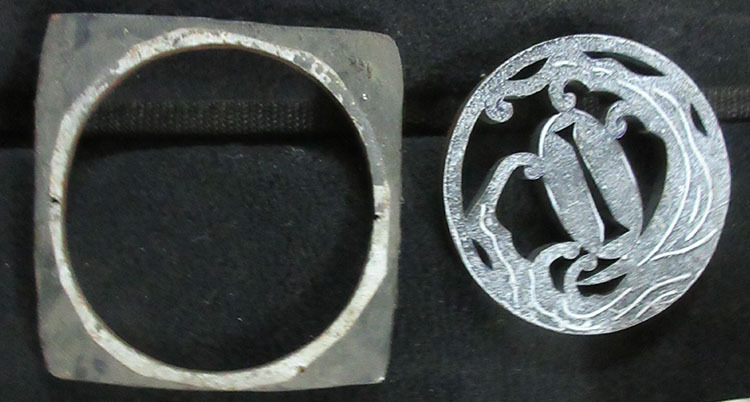 If you think that is time intensive, that is just the beginning.The details are all hand engraved by seating the tsuba into a sticky resin that holds it firmly in place so that the engraver can bring out the finest details.. 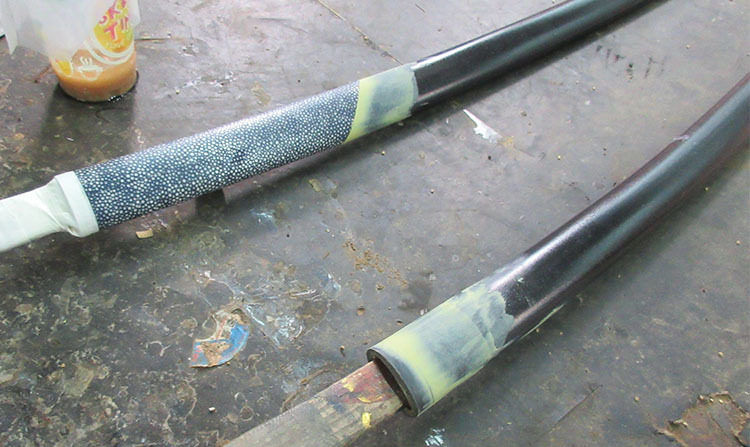 But if they feel that a Japanese set of imported Koshirae (fittings) is better for a particular sword, then they will make the sword to match the fittings.. And occasionally, they do outsource a few exotic jobs here and there - such as this stunning eggshell pattern on a saya that was done across the border in Vietnam - even though it would be cheaper to do in house..
Perhaps that is one of the things that separates Citadel Knives and Swords from other sword making companies. 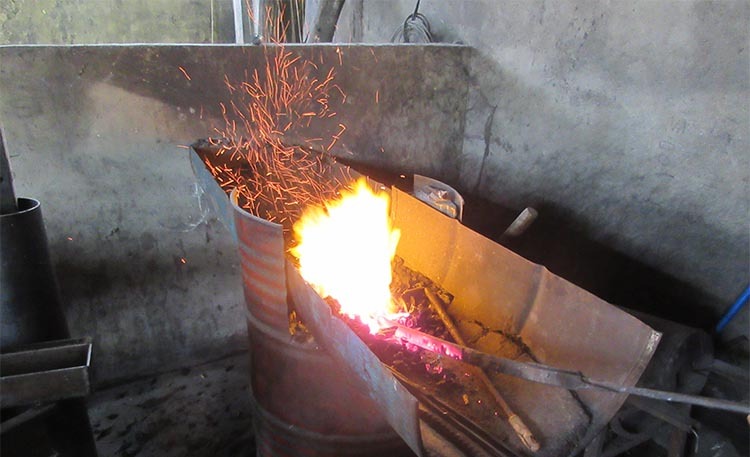 They don't think about cost savings, they just concentrate on making the best product possible - the price doesn't enter into the equation during the process, and is decided after the sword is completed, not before or during..
All in all, it is like no other forge I have seen - and that is because as Dominique stressed many times, they do not make production swords. Each sword is a custom work of art. But just when I thought I had seen everything, I was taken to the a storage area out the back - and then truly began to appreciate what this Citadel Knives and Swords was capable of producing. 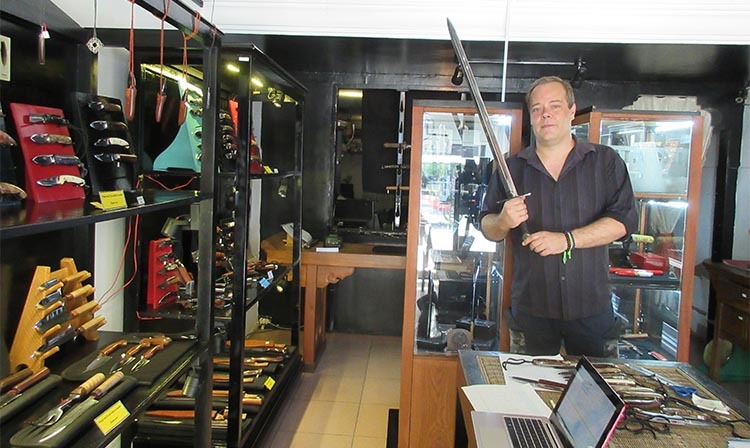 Citadel Knives and Swords are famous the world over for the quality of their Katana. And in the showroom, I saw quite a few completed swords - and got to handle one for the first time.. I wish I had video footage of my reaction when I first held one aloft and took a very gentle swing to get a feel for how it handled.. I am not a trained swordsman, but I have handled hundreds of Katana in my time, from budget swords that sell for $50 to priceless antique Nihonto. 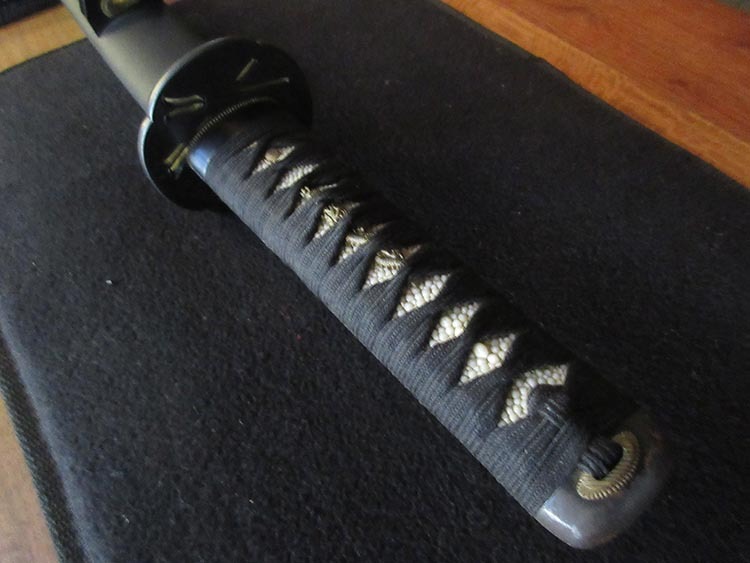 And if there ever was a sword made outside of Japan that handled like a real Nihonto - these were it.. The balance was truly incredible - they literally felt almost weightless - and indeed, when I compared it to a 500 year old Nihonto that Doninique and the team had used as a reference point, I said quite honestly "If I you had not just told me that was an antique, I would have thought it was one of yours"..
THAT is the kind of handling I am talking about - the kind that you cannot really put into words but really must experience first hand. 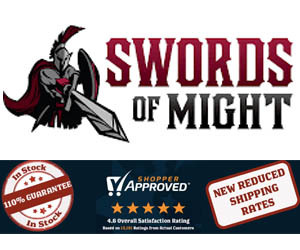 I kind of noticed a similar thing with the medieval styled sword I picked up and handled briefly in their shop. They had two there, one felt very heavy and the other - very fast and responsive in the hand.. But now, I had found the mother-lode. Some of the swords I saw there were rather ahistorical - very much an amalgam of East and West, such as this medieval European/Japanese hybrid with a full ray skin wrapped handle..
And while it did not really look the part, it handled like a dream - lightweight and responsive.. But then I saw THIS..
With a bone handled, wooden pommel and hand guard - and a blade to die for - this Gladius had incredible handling.. The hilt felt perfectly matched to my hand. and even a casual thrust felt like a homing missile with pin point accuracy.. It even came with a historically accurate scabbard (which, blown away by the handling of several Katana and these two European swords, I neglected to photograph!). But that wasn't all. 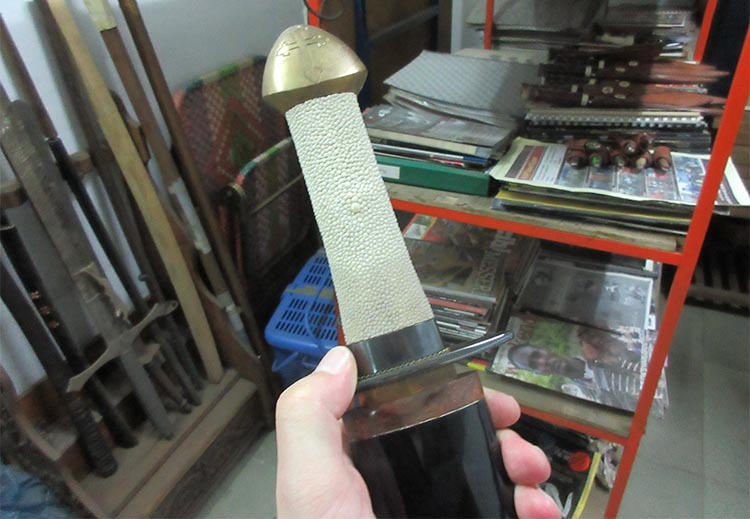 I was particularly interested in a reproduction of a historical Khmer sword - which was something similar to a Burmese Dha, but with a leaf shaped blade and ornate engraved fittings.. Always curious to see rare sword types, I was rather shocked by how heavy it felt in the hand, but Domanique assured me that 'this is the way the Khmer like it' and wondered how such an item would sell, to which Domanique replied "Oh, I had that one made for my own collection"..
Ah, the benefits of owning your own sword forge..
Citadel Knives and Swords truly is a unique company and have achieved what many would have considered to be an impossible task..
“I always say to people that they have three options to get a good katana: the famous Japanese 'living treasures’ where you will have to wait for three years and pay $1,000 per centimeter of blade, a handful of European and US craftsmen where you’ll wait for one year and pay from $7,000 to $10,000; and Citadel where there’s no delay and you pay between $1,500 and $3,500"
Production sword companies do not even compare because, that's not how they make their swords. But I guess by now, you already know that. 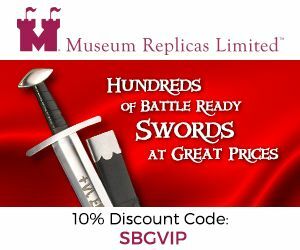 And when you consider what else is available with the same exacting level of attention to detail, their swords are actually a real bargain..